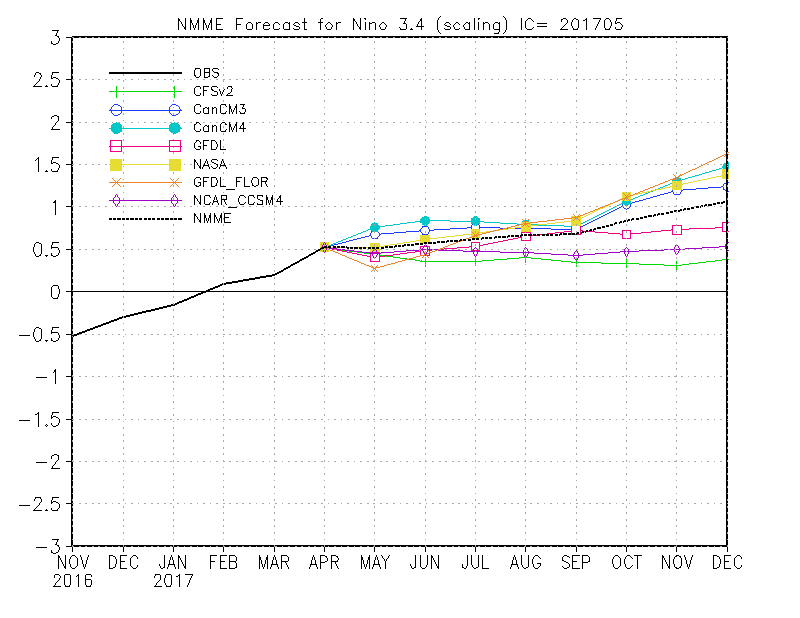 Nino 3.4, CFS2 updated daily. 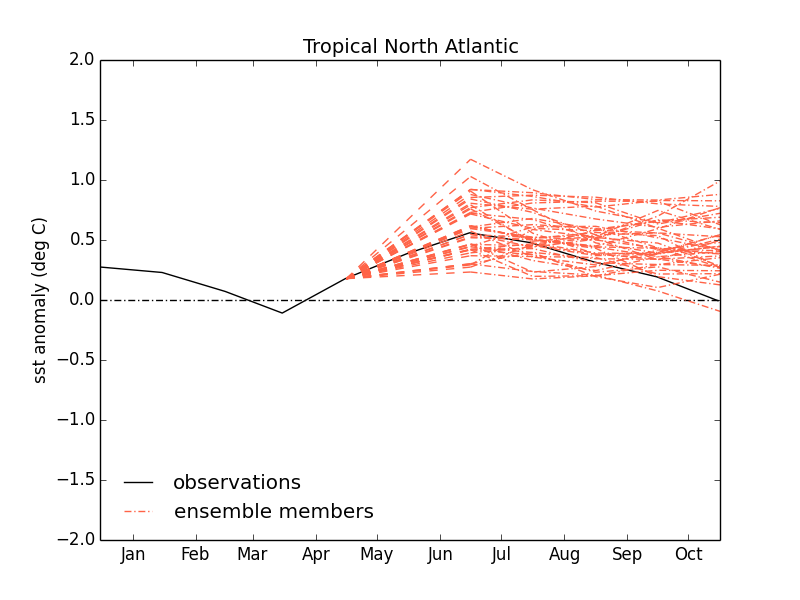 NMME Nino 3.4, UKMO Tropical N Atlantic plot and NAO plot when available. Click image for details. Not available:, India Met Office IMO. Summary - 150517 - Above normal temperatures and possibly well above normal values are indicated, strongest signal is for parts of S to be well above. (An exception to the blanket signal for above normal is from Meteo France which suggests some areas near the East coast and perhaps also the South coasts may be cooler than normal, most likely in June and early July). Implied increased frequency of easterly winds due to higher than normal pressure, especially across the N of UK with some doubt about the S due to lower pressure signal over France and Med extending further north in the Meteo France output. Rainfall signal as usual more mixed but fairly good signal for below normal, perhaps highest signal in the N and W with risk of nearer normal in S. Some risk of above normal in far SE. Month to month data may suggest June wetter than July. NCEP Mean of 40 runs over preceding 10 days. 100KM resolutin output. Anomalies wrt 1999-2010 hindcast climatology. (Normal is +/-0.5C from model hindcast mean). PPN: Season: normal but above in NW Scotland and below in Westcountry. JUN normal but above in SW Eire N England and Highland Scotland JUL normal locally below in E Scotland and NE England but above in W Scotlan and NW Eire/W of N Ireland AUG normal locally above in SE Eire, Cornwall, SE Midlands and SE England. season: Two lobes to the pattern one near normal and one well above normal. Overall pattern shifted above normal with prob of below normal less than 20%. Summer could be warmest for UK since 2006. June: Two cluster, one near or slightly below normal and the other well above normal. On Balance above normal more likely. season: Two cluster one below normal and the other just above which may mean a prolematic split across the UK between wetter and drier types. Given wetter June remainder of summer could be drier. Output based on recalibrated NMME (since April 2017). Comment 150517-French have High pressure further north and lower pressure over France and S UK rather than over France and Med as is EC and UK. Consequently more cyclonic cloudier and colder pattern. TEMP: above normal 40-50% UT, 30 to 40% S and W UQ. PPN: mixed picture but 40-50% in LT Eire, N Ireland, N and W Scotland and N England. UT in far SE England. In summary below normal in N and NW half of UK, risk of above in far SE, elsewhere no signal. TEMP: Above normal (UT probs 50% in S to 70% in N and W.) Mostly 40 to 50% prob UQ. PPN: E and S 40 to 50% LT, elsewhere no signal. W Wales 40% LQ. Summary below normal in S and E risk of above in Eire. PMSL: Central England abave normal (UT), S England and S Eire near normal (MT) elsewhere no signal. Central Eire 40% UT. PPN: Below normal in N and NW risk of above in S of UK. N half Eire, N Ireland and W Scotland 40 5o0 50% LT with W Scotland 60%. S England 40 to 50% UT. W Scotland 30 to 40$ LQ. UKMO Glosea5 0.8*0.5 deg (50km mid-latitudes) resolution 2 runs daily accumulated ensemble over 3 weeks 85 levels to 85 km. 75 ocean levels (0.25° x 0.25) - 14 year hindcast 1996-2009. 42 ensemble members. PPN : W and NW Eire above normal elsewhere below normal most likely. Enhanced probs lower quartile except Eire and NW scotland but caution similar enhancd probs for upper quartile in Eire, N Ireland, Wales NW England and central Scotland. PSML: Above median most likely except N Scotland and N Ireland. Above normal (tircile) with the far S nearer. Emhabnced probs for well above normal. See graphcs below for monthly variation.